Astley performin in Santiago de Chile, in 2009. 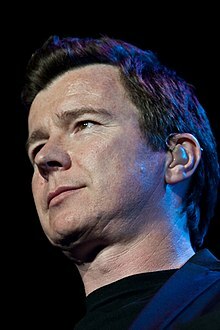 Richard Paul "Rick" Astley (/ˈrɪk ˈæstli/; born 6 Februar 1966) is an Inglis sangster, sangwriter, muisicker, an radio personality. His 1987 sang, "Never Gonna Give You Up" wis a No. 1 hit single in 25 kintras. Bi the time o his retirement in 1993, Astley haed sauld approximately 40 million records warldwide. This page wis last eeditit on 8 November 2016, at 02:59.